На этой странице Вашему вниманию предлагается подборка писем о праздновании Рождества и Нового года в России, написанных моими учениками. Задание 39 относится к заданию базового уровня из раздела Письмо на ЕГЭ по английскому языку. Задания взяты из пособия Е. С. Музлановой "Английский язык. Экспресс-репетитор для подготовки к ЕГЭ: «Письмо» ООО «Издательство Астрель», 2012 г. и пособия под редакцией Л.И. Романовой «ЕГЭ Английский язык Письмо», Айрис-Пресс, Москва, 2009. This is an extract from your pen friend’s postcard. …I’m having a busy time at the moment as I have to write lots of Christmas cards to all my friends and relative. Do you celebrate Christmas in Russia? What holidays are celebrated in your country? What is your favourite holiday? How do you celebrate it? Well, I’d better go now. I’ve to help mum with cooking. Thanks for your letter. I’m awfully sorry for not replying sooner. Frankly speaking, Christmas which is celebrated on the 7 of January in our country, isn’t so popular as New Year’s Day. At Christmas night lots of people go to church to mark the birth of Jesus Christ. Children enjoy singing carols. As my father is a priest in the local church, I always help him in the altar during the mass. I like Christmas best of all because the solemn moments of the holiday make me feel happy. We also celebrate Women’s Day, Easter, Victory Day, Day of People’s Unity and Independence Day. By the way, how do you celebrate Easter in Britain? Are there any Halloween traditions you don’t like? When do you mark Mothers’ Day? …We had a lot of fun on April Fools’ Day. Do you have the same holiday in Russia? Could you tell me please about Russian holidays? Write a letter to Paul. Thank you for your letter. I hope all’s going well. You know, we don’t actually celebrate April Fools’ Day but sometimes we play pranks on our classmates and friends. 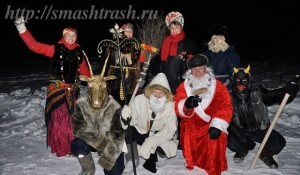 As for Russian holidays, the most popular among them are New Year’s Day and Christmas. We usually decorate a New Year tree, send colourful e-cards and give presents to our friends and relatives. New Year’s Day is considered to be a family holiday that’s why most people stay at home to see the New Year in. Also we celebrate Women’s Day, Victory Day and Independence Day. You may attend concerts and fireworks that take place in many cities throughout the country. It’s great you’ve got a new phone! Is it a touch screen smartphone? Can you email from it? What options does your new phone have? Is it the latest model of Nokia? What options does it have? Is it a slider or a classic model? Is there a dual SIM-card in your new phone? What colour phone did you buy? / What is the colour of your new phone? Why did you buy this particular phone model? Does it operate faster and more stable than your old phone? Does it often slow down? Is it a modern touch screen smartphone? It helps you to be in the loop, doesn’t it? Can you email from your phone? What accessories have you bought with your phone? Have you got GPS navigation on your new phone? …Yesterday we went shopping. I bought Christmas presents for my relatives and friends. There were so many people everywhere. How do you usually celebrate Christmas? Thanks for your letter. It is nice to hear from you again. It’s great Christmas is coming! Do you know that in Russia we celebrate it on 7 January? Church-goers and common people head to church at Christmas night. Children go from door to door singing Christmas carols and people give them sweets, fruit and some money. Kutya is a traditional Christmas dish in Russia. But lots of people like New Year’s celebrations most of all. They decorate a fir-tree, send greeting cards and give presents to their nearest and dearest. New Year's Day is strongly connected with «Olivye» slad and tangerines in people's minds. Children have New Year parties at school too. By the way, what is Boxing Day? Do you know any Christmas carols? Do you still believe in Santa Claus? You usually celebrate Christmas on 25 December, don’t you? Why do children hang up stockings on their beds at Christmas? Do you send Christmas post cards or e-cards to your friends? What is the traditional Christmas dish in Great Britain? How many ingredients do you need to make the Christmas pudding? What is Boxing Day? / When do you celebrate Boxing Day? Do you know any Christmas carols? Where is the main Christmas Tree in London? In Great Britain people prefer to decorate an artificial Christmas tree nowadays, don’t they? Hope you liked the material. If so, share it with those who might need it. And thank you for reading me.